The ice and snow may have melted but, as auto accident lawyers know, wet pavement can be just as dangerous when it comes to getting into a car accident. With Michigan’s Spring weather headed our way, the car accident lawyers here at Gold Star Law would like to share a few tips to help keep you safe this spring. Check your tires. Sliding on wet pavement causes numerous motor vehicle accidents. Maintaining proper tire pressure and replacing your tires when the tread gets worn down are important steps to take in order to help prevent your car from sliding. Replace worn windshield wiper blades. If your windshield wipers are leaving streaks when in use, your vision may be obstructed. Maintaining a clear line of site is imperative to helping you avoid an auto collision. Keep things bright. 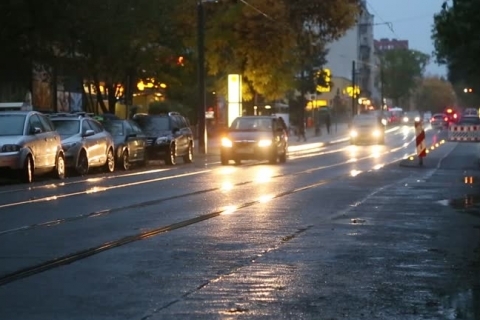 It is important that you can see and be seen when driving in rainy or dark conditions. Make sure your headlights, taillights, and brake lights are all in working condition. Avoid tailgating. Rear-ending the vehicle in front of you can cause catastrophic injuries. If your vehicle does begin to slide, it is crucial to have enough space between you and the vehicle in front of you in order to avoid a car crash. If the vehicle behind you is following too closely, there is a risk that they may smash into your vehicle. When possible, switch lanes in order to get out of the other vehicle’s way. If switching lanes is not an option, you can try to encourage the other vehicle to go around you by slowly reducing your speed. You should also avoid sudden hard braking as this could result in a rear-end collision. Of course, accidents can still happen even when the proper precautions are implemented. If you have been injured in an auto accident, call Gold Star Law today for a free consultation with our auto accident lawyers.